A project to design and build hydraulic robotic arms powered by syringes taught a class of engineering students about the challenges of the profession. Teams demonstrated their creations for the third-year course “Manufacturing Process Design,” Thursday in the Centre for Engineering Innovation. Each project had to incorporate several joints and be able to grasp and lift an object, operated by rubber-piston needle syringes. Designs incorporated wood and metal, dowels and glue, 3D-printed and molded plastics, employing fluids as different as oil and water to operate crab-like claws. A volunteer from Scouts Canada helps students Malav Rathod and Amir Sarikhani prepare for the first-ever Gravity Car Race held by the Master of Engineering Auto Student Advisory Council. Scouts Canada provided the racetrack. Mechanical engineering students took a break from their books Friday to compete against their peers in a gravity car competition. More than 50 students took part in the friendly competition hosted for the first time by the university’s Master of Engineering Auto Student Advisory Council. “This competition is an opportunity for students to showcase their design skills and their knowledge of fundamental engineering concepts such as aerodynamics,” said Tracy Beemer, program administrator for the MEng Automotive program. 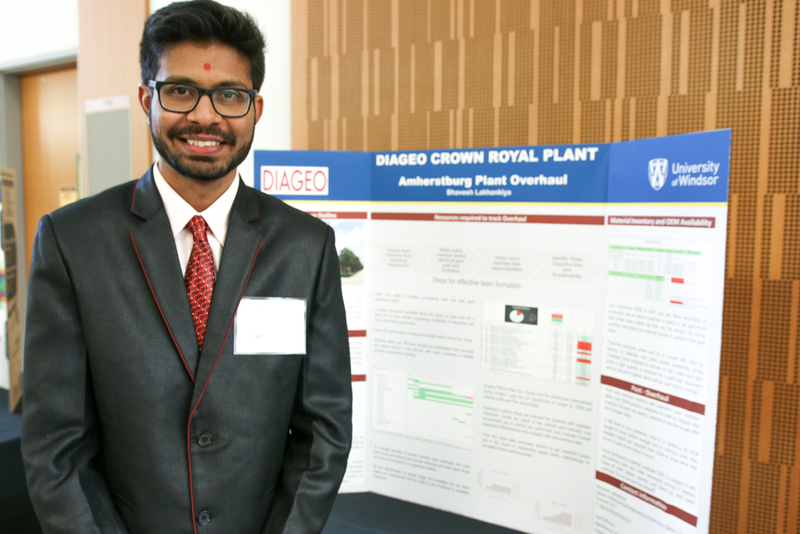 A team of engineering students has designed a cost-effective and sustainable erosion control structure that will help protect a children’s camp based at the riverbank of the Saugeen River in Walkerton, Ontario. Camp Cherith, a Christian camp for children and youth, approached the university in fall 2016 to seek help with its erosion problem, which has resulted in significant property loss and affected regular camp activities. (L-R) Dr. Tuhin Banerji, Scientist, CSIR-NEERI; Mukesh Kumar, Junior Engineer, Delhi Govt. ; Dr. Rajesh Seth, University of Windsor; Dr. S.K. Goyal, Scientist and Head (Delhi Zonal Laboratory) CSIR – NEERI; and Rashmi Misra, CSIR-NEERI pose in front of the project site at Sonia Vihar Lake in India. A UWindsor engineering professor is leading the way on an industry-academia collaboration that aims to improve drinking water quality in the capital of India. Dr. Rajesh Seth has obtained funding through the India-Canada Centre for Innovative Multidisciplinary Partnerships to Accelerate Community Transformation and Sustainability (IC-IMPACTS) — a Canadian Networks of Centres of Excellence (NCE) dedicated to the development of research collaborations between Canada and India. The joint project with researchers from the Council of Scientific & Industrial Research (CSIR) – National Environmental Engineering Research Institute (NEERI) in India aims to improve sewage contaminated lake water quality through aeration and floating wetland plants. Dylan Verburg, an environmental engineering MASc. candidate studying under Dr. Seth, will spend the fall semester in India collecting samples and data from Sonia Vihar Lake, a small polluted water pond which discharges into the Yamuna river — a source of Delhi’s drinking water.